Masamune's special costume from the BSR48 video was a huge hit when it first debuted, and now it looks as though the casual outfit is making its way to the game series. 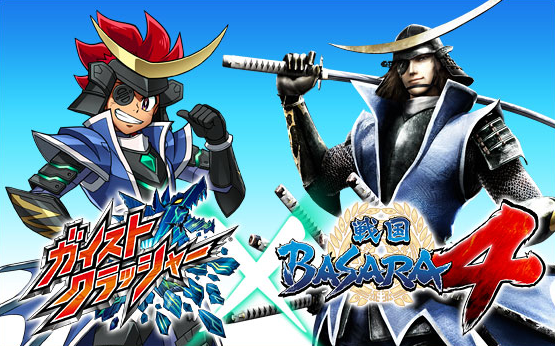 I was disappointed for literally seconds about the idea of DLC for the series before it turned into unbridled excitement at how cool Masamune looks. Needless to say I'll be getting this costume and buying any other DLC which ends up coming out later on. 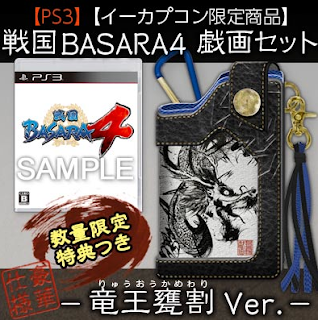 There will be no less than four special versions of Sengoku Basara 4 available through Capcom's webstore and they've set up a special page to explain the differences. The Hyakka Ryouran Tamatebako edition costs ¥8,790 and its extra features are a 100-page Sengoku Basara 4 storyboard collection, an 80-page hardcover A4 book about the commanders titled 'Sengoku Basara 4 Bushou Hiden No Sho', a special Masamune jacket (sleeve) for the game and a golden-coloured Masamune custom theme for your PS3, presented in a special box. It's also available through other stores (I just reserved a copy from Amazon Japan). I'll add more store links as soon as the listings are available! Edit: Now also available from Yesasia Global, Yesasia USA, HMV Japan. HMV has a note on the listing implying it might include an additional bonus. 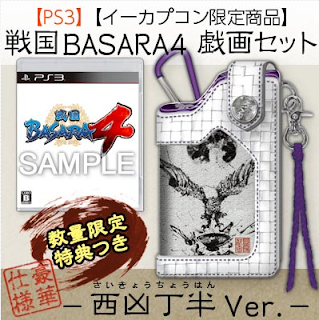 The Ryuuou-Kamewari version is priced at ¥9,990 and includes a leather case showing the Basara-e artwork for Masamune and Katsuie. This edition is exclusive to e-Capcom. The Saikyou-Chouhan version is priced at ¥9,990. 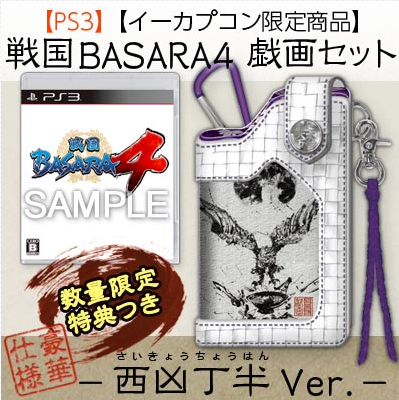 It's exactly the same except the special leather case has the Basara-e for Mitsunari and Sakon on it. This edition is exclusive to e-Capcom. Lastly, the standard edition is priced at ¥6,990. It's available at regular stores like Amazon Japan too, of course. Edit: Also available from Yesasia Global, Yesasia USA, HMV Japan, Play-Asia. Please note that Yesasia and Play-Asia do not list the DLC in their description for this version while HMV Japan does and also appears to have some kind of bonus included. 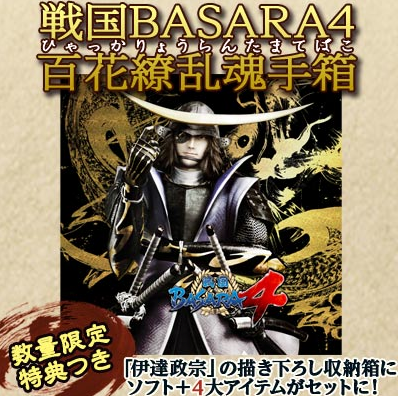 All four editions will come with the download code for Masamune's special costume as a first press bonus. 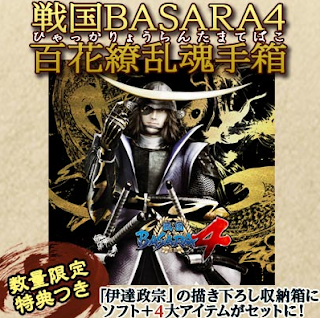 We now have more information about T.M.Revolution's theme song for Sengoku Basara 4. It will be titled 'Count ZERO'. SCANDAL's ending theme is to be called 'Runners high'. Both songs will appear in future promotional videos on the official website and in game stores in Japan. 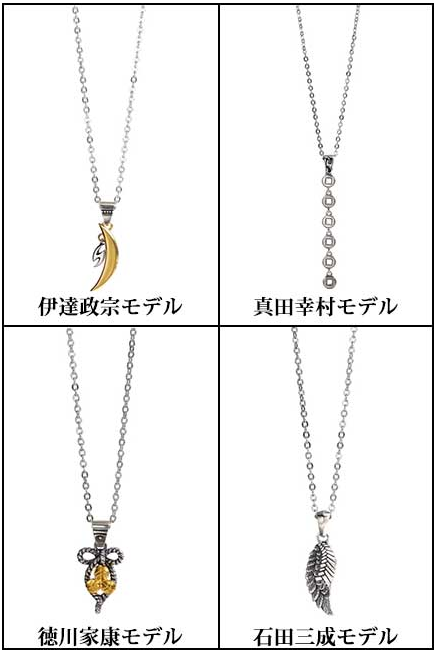 e-Capcom has also added details of four new Sengoku Basara 4 x Bizarre silver pendants available from the beginning of 2014 and priced at ¥9,450 each, in collaboration with the popular Harajuku 'Bizarre' brand. There are designs representing Masamune (lightning/crescent moon), Yukimura (fire/six coins), Mitsunari (feather/embroidery) and Ieyasu (rope/mitsuba aoi crest). Male fans shouldn't feel left out as there's also going to be a Sengoku Basara 4 x Betones collaboration to produce a range of character-themed boxer shorts for men this December. 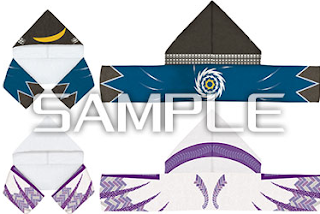 The boxers will cost ¥1,995 for each one-size-fits-all pair and three designs are available: Masamune/Katsuie, Mitsunari/Sakon and Yukimura/Sasuke. It's been announced that the upcoming November stage play Butai Sengoku Basara 3 Utage Two: Kyouou Tanjou x Shinen No Utage will have some 'after talk' cast talk shows after three of the Nagoya shows (15th November at 18:00, 16th November at 12:00 and 16th November at 17:00). The cast members who will participate are Nakamura Seijirou (Ishida Mitsunari), Yoshida Tomokazu (Katakura Kojuurou) and Murata Youjirou (Sarutobi Sasuke). The official website has updated to add placeholders for Ieyasu and Tadakatsu as revealed in today's issue of Weekly Famitsu (see my previous post). Their sections will open on 26th September 2013 to reveal their full artwork, voice samples (well, for Ieyasu at least...) and screenshots. There's also an explanation of the Stylish Gauge mechanic I talked about yesterday. It costs ¥1,000 to join, then ¥4,000 each year for the actual membership - however, if you sign up between 1st October and 30th November the setup fee will be waived. The official website for the new club is here. I posted about this back in February when it was just a rumour, and finally it's come to fruition! 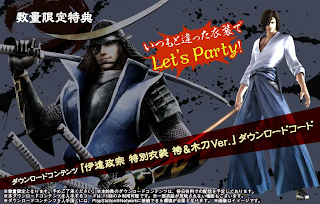 The popular Ichiban Kuji lottery will be running a Sengoku Basara 4 prize campaign in mid-January with tickets costing ¥600. 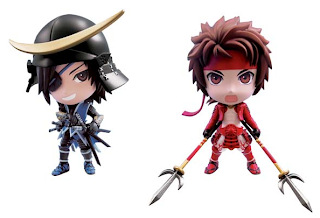 Every tickets wins some kind of prize, but the exclusive 'Kyun-Chara' figures of Masamune (A-rank prize) and Yukimura (B-rank prize) are sure to become sought after. The news bulletin notes that Masamune's helmet can be removed. There will also be a prize campaign at Japanese amusement arcades which includes these dapper Masamune and Mitsunari wearable hood towels. The official website for the lottery will be launched on 24th September. I'm not entirely sure I find the Ichiban Kuji prize figures all that cute. 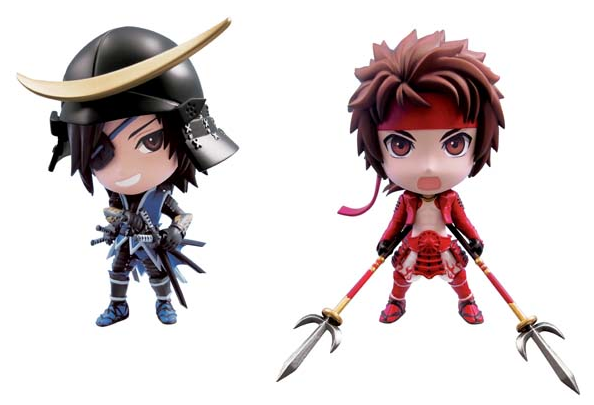 Fortunately, there will also be a set of Mame Sengoku Basara trading figures released more conventionally in January. Although there's been no formal announcement so far, the unpainted computer-generated mock-ups can be seen in one Twitter user's snapshot (edit: here's another two with samples), clearly revealing that the line will include 'mame' versions of Masamune, Yukimura, Ieyasu, Mitsunari, Kojuurou, Sasuke, Motochika and Motonari with one 'secret' figure to collect. Each blind-boxed trading figure will cost ¥693. 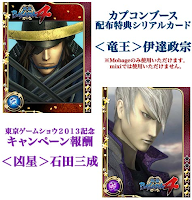 As well as the 'Dragon King' Masamune card I mentioned before which visitors to Tokyo Game Show 2013 can pick up at Capcom's booth, players of mobile game Sengoku Basara Card Heroes Matsuri can obtain a unique Mitsunari card by logging into the game and participating in the event currently taking place. I haven't been following Capcom's brand new Geist Crusher title (or possibly Gaist Crusher according to the official website). 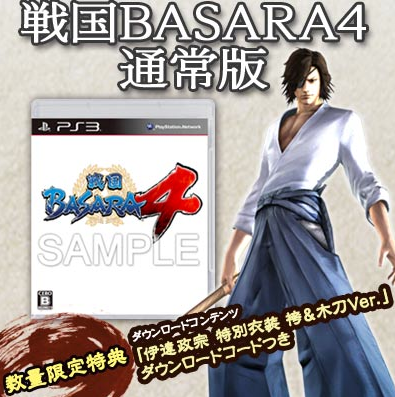 Apparently, that was a mistake, since they've announced some crossover fun with Sengoku Basara 4. 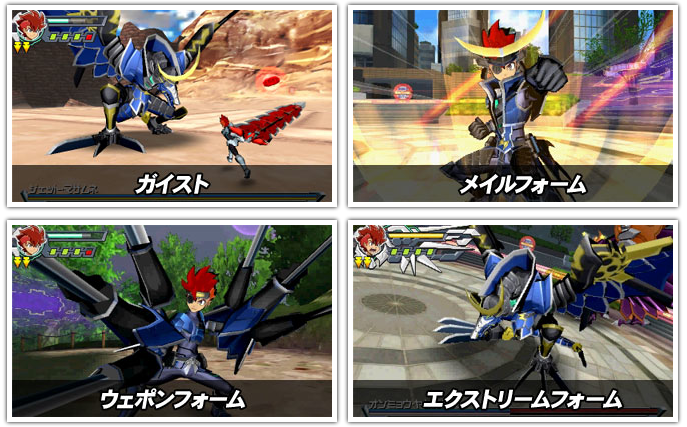 Date Masamune will appear in the game as 'Jet Masamune'. I'm afraid I have no idea what any of this means in context, but it looks good fun. There's a clip in this video too. No details have been revealed yet but there will be some kind of Sengoku Basara content at October's Machi Asobi event. Machi Asobi will run between the 10th and the 12th of October 2013 in Tokushima. It's the first day of TGS so there's a lot going on, and there'll be even more news this weekend after the stage presentations take place. Famitsu has posted first gameplay impressions, an interview and a stage report so far. The venerable Nine Demons Yoshitaka has been able to report some of the reveals in his posts over at the Koei Warriors forums and the booth looks fabulous. You need to use a deputy service or have a forwarding address for games, unfortunately (most items they ship worldwide but toys and games are special). I expect that regular importers such as Play-Asia, Yesasia, Amiami, CD Japan and all of the others will list the special box edition in the next day or two, and I'd definitely recommend going with one of them over using a deputy in this case as it will be quicker and cheaper. I'll add more shopping links to the main post as I find them. Thank you for your response! *u* Infact I'm person who always use AmiAmi, CDJapan and similar, but I found a deputy service for things like that and made an account, just to be sure. If nothing will pop out, I'll use the deputy service. Thanks again! Good luck! I hope you can place your order soon. Hey there, I was wondering if you could personally recommend any particular deputy/shopping services that might be able to get things to the UK via amazon.jp and/or e-Capcom...? Sorry if you've been asked that a lot, and thank you in advance! I know there are a lot out there but are there some you would personally trust above others...? No problem. I keep meaning to make a shopping guide post but Capcom release too much Sengoku Basara news all of the time (hehe). Here are the ones I have personal experience with. CD Japan: Expensive but very reliable and you can probably ask them whether they'll stock the special edition themselves at the same time. Celga: When I've used them they were slow, but they know what they're doing and I happen to know they have past experience buying from e-Capcom. Otokichi Premium: This service is run by one person, but he's lovely and very helpful. Shopping Mall Japan: Reliable, if a little fiddly to use. FDJP: I have used them for some obscure things. Reliable but can be expensive. I have never used Rinkya but they're a reasonably popular deputy service too. If you can buy the item yourself, it can be easier to use a forwarding-only service like JapanToDoor or Tenso or Big In Japan. This gives you more control. It's really expensive using a deputy compared to buying directly, so I hope the listings will appear on normal websites very soon! In this case I'd probably recommend contacting CD Japan under the circumstances. They'll be able to advise on availability most knowledgeably and procure the versions you can't get from them directly if needed. Thank you so very much for all of this info! We certainly can't blame Capcom for giving us lots of shiny new updates - which your page is fantastic for keeping up to date with, needs to be said! I may go with CD Japan just to be safe. I'm thinking of nabbing the Tamatebako edition as well, and was hoping it would go up on PlayAsia or the like today but it hasn't and I'm somewhat impatient... Would you say that's a better/more reliable idea than using somewhere like JapanToDoor, even though it can all go through amazon.jp? Thank you very much again for all your help! Going to save that post somewhere for future reference I think. You're most welcome. I'm sure it will be fine but if you end up struggling to get hold of it feel free to say - I'm happy to help track a seller down if it does disappear fast. It's not even listed yet on other Japanese stores so it will probably appear everywhere else towards the end of the weekend (or on Monday) when Capcom finally get around to sending out the official solicitations. Yes wow so much news now! The release date is surprisingly soon. I always prefer for creators and companies to spend as much time as is needed to make something great, instead of rushing it. Hopefully SB4 is great and not rushed. Masamune's sword practice outfit was a good idea for an alt costume and it looks nice. And he is the most popular so Capcom really knows what they're doing here. Hopefully all of the characters will get a wide selection of costumes, including some of the coolest alternate outfits from the older games.